NES River City Ransom (USA) "2 players" in 05:56.76 by Chamale. In River City Ransom, Alex and Ryan face off against gangs of students and evil bosses to win their town back and rescue their girlfriends. 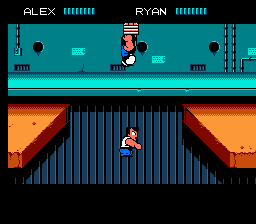 Several bosses need to be found and beaten before you can enter River City High and beat up the final bad guys (including an obvious imitation of the Double Dragon heroes). The gameplay also has elements of an RPG, where you can level up your character with shop purchases, but none of that is done here. A glitch that is abused often in this run, pressing Left and Right at the same time, causes the player character to do all sorts of crazy things and usually lose all of his power. This is done to reduce lag during running segments and abuse collision detection. This run obsoletes the previous one by nearly a minute due to much more optimization of boss fights and some new tricks. Weapons are also used more, so expect to see some chains and trash cans! For a River City Ransom movie that concentrates more on goofing around than aiming purely for speed, click here. For a run that only uses Ryan, click here.